If you thought a folding bike was just for city riding….think again. 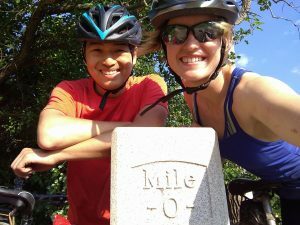 Continuing our trend of a yearly summer adventure, my boyfriend Terrence and I chose to bike the Great Allegheny Passage Trail and C&O Canal Trail from Pittsburgh to DC. I have an old Schwinn, but he lives out of state, so luckily I was able to borrow a CHANGE bike for him to use, and just throw it in my trunk to get it to our starting point in Pittsburgh. We got it all outfitted for the trail with a rack and water bottle holders (it still folds even with these additions!) and set out from Pittsburgh’s Point Park. A CHANGE mountain bike ready for adventure. We left a little late due to maintenance issues on my bike, and the struggle to pack everything for a week in 4 panniers, but had a nice afternoon. 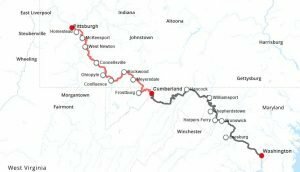 It was an easy first day of 30 miles to Dravo Landing campground along the Youghiogheny river. Beautiful section of the GAP trail. Next day we made up the extra mileage from the day before and continued into Ohiopyle. After relaxing at the pub with some beer, we set up to find our campsite for the night, only to learn than it was 3 miles off trail…up a steep hill. So instead we continued for another 11 miles of flat-ish trail to Outflow campground in Confluence, finishing off the day at mile point 75. After a long day in the sun, we just wanted to sit in the river and cool off. After I started using river water to wash off a bit, Terrence stopped and pointed out that this campground actually had showers. 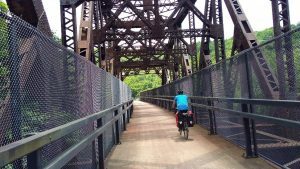 Lots of cool railroad bridges and tunnels along the GAP trail. We continued the slow climb up the next day to the Eastern Continental Divide. The high point of the whole trail at 2,392’. It had started to rain, but now it was downhill time! We cruised through the next 25 miles to Cumberland, MD. Along that section was a half mile long tunnel. It filled with mist in the rain and was spooky and quiet. We stopped and just listened to the quiet, until 15 boy scouts dressed in orange all caught up to us, and the moment was gone. Back out into the rain. 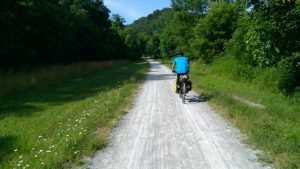 In Cumberland, the GAP trail ends and the C&O towpath begins. We spent the night at the YMCA picnic shelter and even got free showers the next morning! The C&O trail is less maintained, with branches across the trail, rocks and ruts, and a lot more mud from the precious night’s rain. I was very jealous of Terrence’s disk brakes and shocks on the CHANGE bike. The C&O in one of its better maintained spots (the only place I could bike one-handed in order to photograph). But also with its remoteness, there was more wildlife. Over the next three days we saw wild baby turkeys, an alligator snapping turtle, eastern box turtles, great blue herons, some type of owl, and countless deer and rabbits. There is also more history along this section of the trail. We passed an old cement mill, the Antietam battlefields, and dams and lockhouses from the canal’s past. The canal was originally built to parallel the Potomac from the Chesapeake Bay to the Ohio River. There was much excitement when it broke ground in the 1820s, but the railroad going the same route from the other direction broke ground the same year and finished first. Due to all the locks and tunnels required, the canal was never actually completed, and construction stopped in the 1850s, miles short of its original destination. 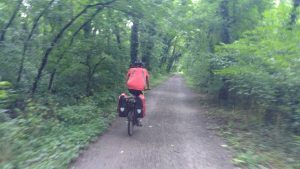 Day 4 included an unexpected hike with the bikes up and over Paw Paw tunnel that was closed due to construction so we didn’t get as far as intended and spend the night at a free campground by Hancock, MD. Day 5 was all skidding and sliding through mud. It rained all day and my wrists got sore from holding so tight to the handlebars. Terrence found a very pointy piece of shale that punctured his tire, and we repaired in on trail, only to learn that we hadn’t cleared the rock fully out of the tire and it punctured the new inner tube as well…Here we go again. 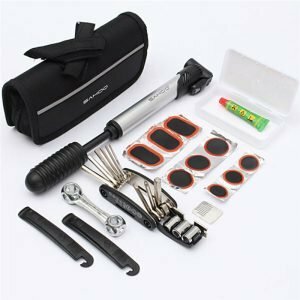 A good bike tire repair kit can save your trip. 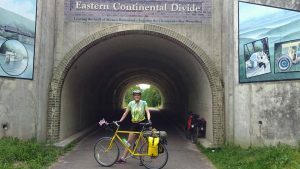 Only 20 miles by lunch that day, though it was nice to get of the rain for a little bit at a lovely under cover picnic shelter in Williamsport, MD. We even found a café that sold inner tubes (to replace both spares we used) and hot chocolate. Everything we needed!! Back on trail we made it to another free campsite just before Harpers Ferry, WV. We woke up to more rain, but the promise of hot showers and warm food kept us going. The urge to stop at the great Falls Tavern for a beer was very hard to resist, but if we had celebrated with another 14 miles to go, we would not have made it to the end. After a brief detour to the newly opened Great Falls overlook, we made it to Georgetown. With one mile left to go….the trail disappeared. It had been lost in the development of the area, but we luckily found our Mile 0 post tucked away by the boat house. After some much needed celebratory food, we got picked up by car. My bike took up the whole back of the car, while the CHANGE mountain bike folded in right to the side. 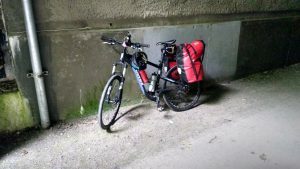 For 335 miles of hard trail riding, this bike provided great gearing for the uphills, reliable brakes in rain and mud, and a solid frame for carrying gear, then just packed away at the end. Whatever the adventure of the year is next year, a CHANGE bike definitely makes it a lot easier. I might need to get one for myself too! Can you put drop bars on a CHANGE Bike?